STARS is a two-week summer research experience designed to support the next generation of minority scientists, doctors, and other health professionals. This program provides students with state-of-the-art laboratory and computer science skills needed to succeed in STEM (science, technology, engineering, mathematics) in college and beyond. Students will conduct hands-on science and computer projects and participate in enrichment activities including discussions with researchers and tours of the Cold Spring Harbor Laboratory and Stony Brook University campuses. After the two-week program, students will also have a line of communication to mentors who can provide advice on finding future research experiences and preparing for college. Classes will run Monday through Friday, from 9:00 a.m. to 4:00 p.m. (Stony Brook field trip day will conclude at 6:00 p.m.). No transportation will be provided; parents are responsible for on-time drop-off and pickup. 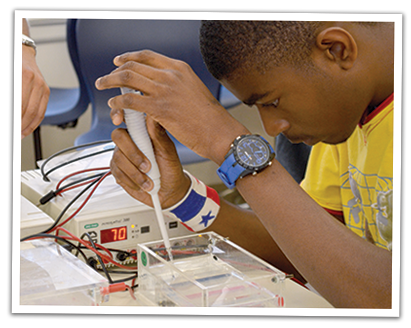 The STARS program is limited to students who are underrepresented minorities in STEM (defined by the National Science Foundation as Black or African American; American Indian or Native Alaskan; Hispanic or Latino; and Native Pacific Islander); eligible students will have completed the 9th grade. All accepted students will have the $1200 tuition waived. As part of their service as scholars, students will have a community engagement responsibility, including a presentation at the end of their research experience and helping to recruit and support future STAR scholars. Students must prepare a short personal statement on why they want to apply (500 words or less). Students must provide a copy of their latest report card OR a letter of recommendation from a science, math, technology or other STEM teacher. Applications will be reviewed on a weekly basis until July 31st, or the camp is full. Qualified applicants will be typically approved within 7 days (usually on Fridays). Applications submitted after the camp fills will be waitlisted. If you have questions, contact Jason Williams at the DNA Learning Center at williams@cshl.edu.